This post got a little out of hand. I don’t think I’ll ever write about moons again. Thus we end up with a moonless proto-Earth until roughly 4.5 billion years ago when it is theorized it suffered the biggest blow our planet has ever experienced. 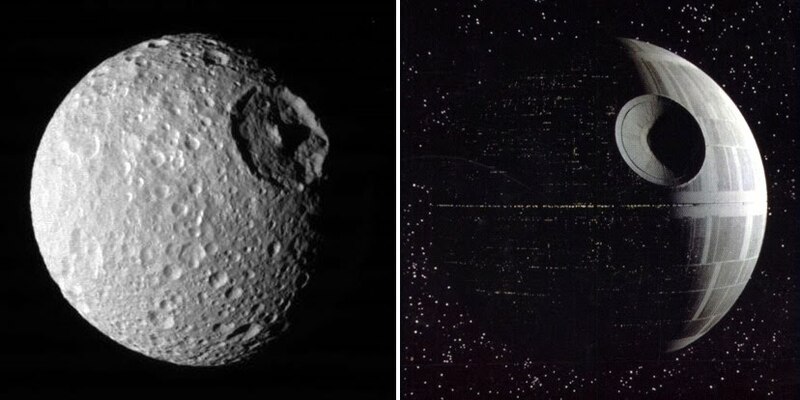 Recent chemical research has shown that the Mars-sized planet that Earth collided with was its twin, a planet called Theia (mother of the Moon in Greek mythology) that must have formed in an orbit almost identical to that of the Earth's. The collision was a glancing one, it shattered our Earth, but pulverized the incoming planet. Simulations show the impactor being sprayed out into a shower of orbiting debris. But within a matter of hours, much of this had re-grouped to form a new impactor that smashed into the Earth's surface a second time at which point the impacting object was destroyed. Most of the impactor rained down on to, and became incorporated into, the Earth - the last major component to be integrated into our planet. Scientists call this point “time zero” as anything that had happened to the Earth geologically before would have been erased. The remaining 10% or so of the impactor’s mass was spread out into an incandescent disc around the Earth - a scorching equivalent of Saturn's rings. It was out of this material that the Moon was formed in a matter of decades. At this time the moon was 15 times closer than than it is today. If you had been able to stand on the surface of the Earth (although its surface was probably melted down to a depth of 1,000 kilometers, cloaking the Earth in a magma ocean) you would have seen a moon that appeared 15 times larger than it does today. Fortunately the Moon-forming impact gave the Earth the spin on its axis that now gives us 24-hour days and stirs up the atmosphere so that no part of the Earth is too hot or too cold for life, so don’t knock it. Google now let’s you peruse the Moon in a Google Maps style format. They also recently offered a 25 million dollar “Lunar X Prize” calling for entrants to land a rover on the moon that will be able to travel at least 500 meters and send high-resolution video, still images and other data back home. Last month NASA announced plans to construct a permanent base on the moon by 2020, a move some consider an essential step towards humankind’s ultimate survival. 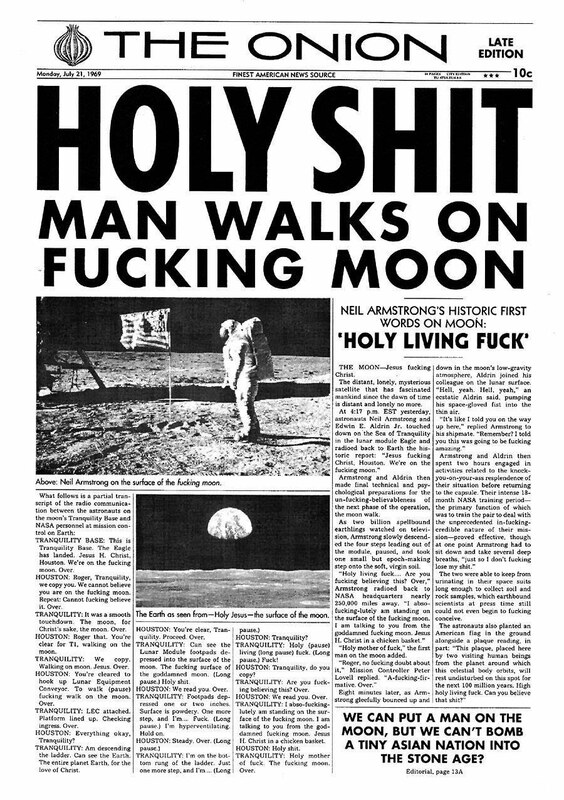 Lastly, who can forget the best Onion headline ever. 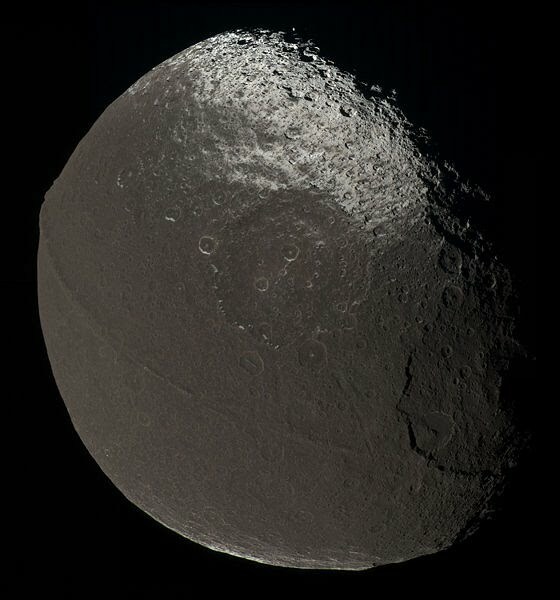 Saturn’s moon Lapetus has been dubbed “The Walnut Moon” because of a unique ridge that runs 1300 km along its equator, 20 km wide and 13 km high. 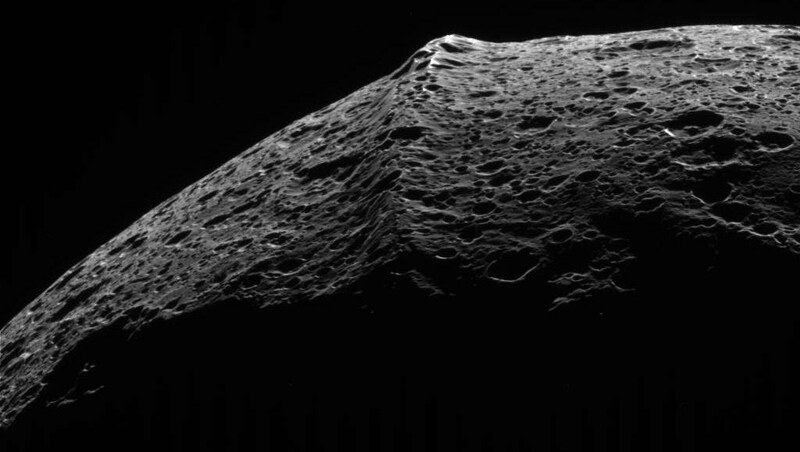 It was discovered when the Cassini spacecraft imaged Lapetus on December 31, 2004. Parts of the ridge rise more than 20 km above the surrounding plains. The ridge forms a complex system including isolated peaks, segments of more than 200 km and sections with three near parallel ridges. Within the bright Roncevaux Terra there is no ridge, but there are a series of isolated 10 km high peaks along the equator. The ridge system is heavily cratered, indicating that it is ancient. Unsurprisingly plenty of people rushed to declare it an ancient barricade or marker created by an alien civilization but in truth it appears to have been formed after the crust froze, when the interior of the planet contracted for some reason, squeezing the crust as though in a vice. My favorite moon by far (so far). It is thought that below the permanently frozen surface of Europa there lies a global subsurface layer of liquid or slushy water kept warm by tidally generated heat. The most dramatic example in support of this theory is "chaos terrain," a common feature on Europa's surface that some interpret as a region where the subsurface ocean melted through the icy crust. This interpretation is extremely controversial. Most geologists who have studied Europa favor what is commonly called the "thick ice" model, in which the ocean has rarely, if ever, directly interacted with the surface. The different models for the estimation of the ice shell thickness give values between a few hundred meters and tens of kilometers. 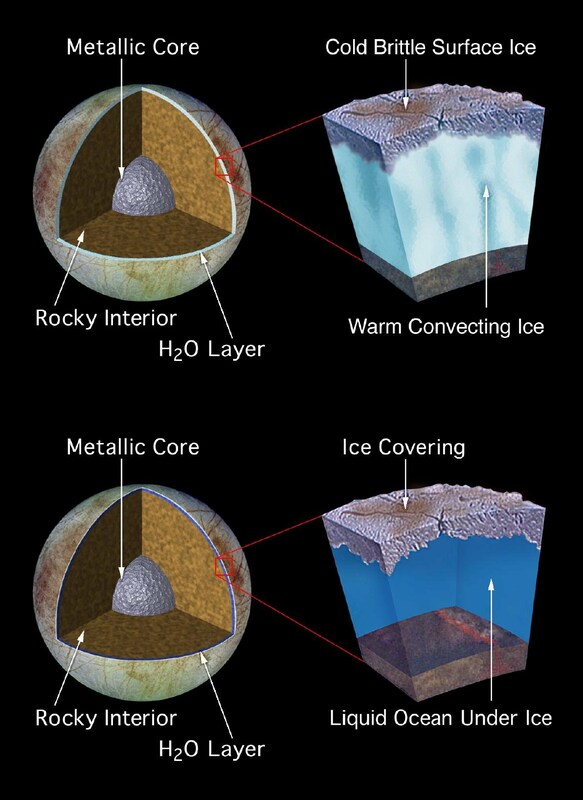 The best evidence for the so called "thick ice" model is a study of Europa's large craters. The largest craters are surrounded by concentric rings and appear to be filled with relatively flat, fresh ice; based on this and on the calculated amount of heat generated by Europan tides, it is predicted that the outer crust of solid ice is approximately 10–30 km thick, including a ductile "warm ice" layer, which could mean that the liquid ocean underneath may be about 100 km deep, suggesting that Europa's oceans are slightly more than twice the volume of Earth's. The so called "thin ice" model is a conclusion of the formation of ridges and the flexure of the ice shell due to loading at the surface. With these models the crust of solid ice could be as thin as 200 meters. The "thin ice" model allows regular contact of the liquid interior with the surface through open ridges. The Galileo orbiter has also found that Europa has a weak magnetic field which varies periodically as Europa passes through Jupiter's massive magnetic field. A likely explanation of this is that there is a large, subsurface ocean of liquid salt water. This moon intrigues astrobiologists because of its potential for having a “habitable zone.” Life may exist in this ocean, perhaps subsisting in an environment similar to Earth's deep-ocean hydrothermal vents or the Antarctic Lake Vostok (another very interesting subject!). 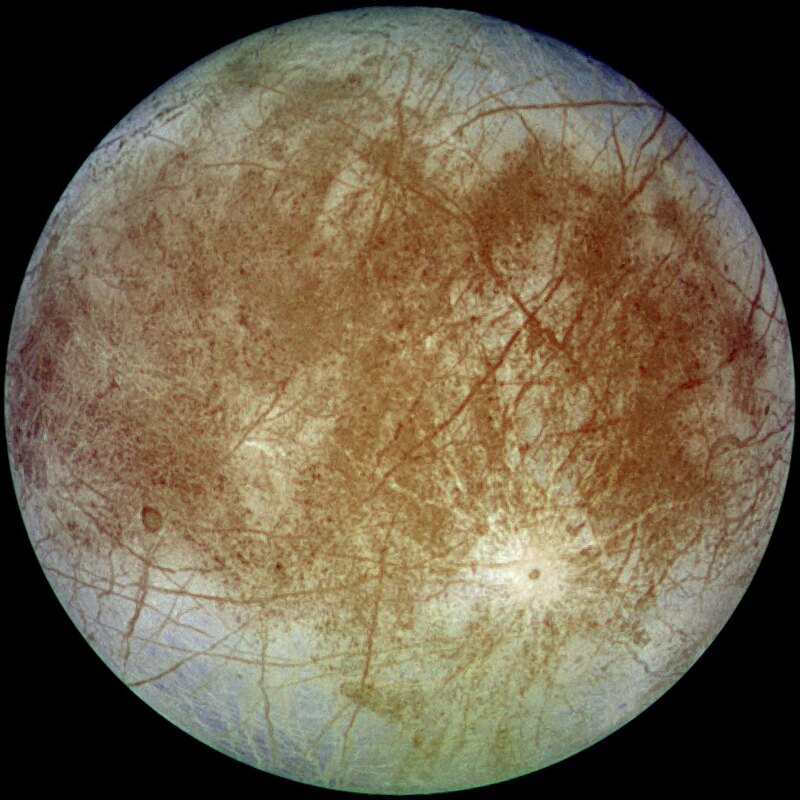 So far there is no evidence that life exists on Europa but due to the likely presence of liquid water, there are proposals to send a probe there. One proposal calls for a large nuclear powered "Melt Probe" (cryobot) which would melt through the ice until it hit the ocean below. Once it reached the water, it would deploy an autonomous underwater vehicle (hydrobot), which would gather information and send it back to Earth. 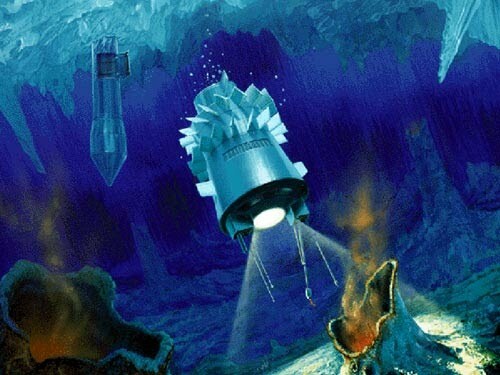 Both the cryobot and the hydrobot would have to undergo some form of extreme sterilization to prevent it from detecting earth organisms instead of native life and to prevent contamination of the subsurface ocean. A "Solar System Exploration Roadmap" published for NASA in 2006 placed exploration of Europa high on its list, and suggested that plans for a "flagship-class" mission to Europa begin by 2008 with hopes to launch by 2015. Io is the most volcanically active body in the solar system. As it travels, Jupiter's immense gravity causes “tides” in the solid surface 100 meters high, generating enough heat to give rise to the volcanic activity and drive off any water. Io's volcanoes are driven by hot silicate magma. On a side note, several people are pointing out the catastrophic result of detonating a 500 mile wide object in low orbit above a small moon. This theory is generally referred to as The Endor Holocaust. 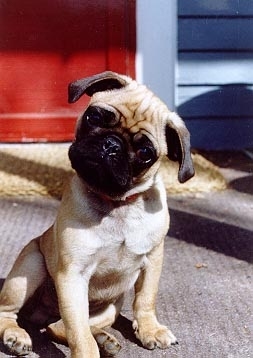 Of course there are also deniers. Although scientists haven’t identified any yet it is theoretically possible (and therefore highly likely) for moons to have sub-satellites of their own! It depends on the object’s gravitational sphere of influence called its Hill or Roche sphere. Earth, for example, has a Hill sphere of 1.5 million km. The Moon's orbit, at a distance of 0.384 million km from Earth, is comfortably within the gravitational sphere of influence of Earth and it is therefore not at risk of being pulled into an independent orbit around the Sun. The Moon has its own Hill sphere with a radius of 60,000 km (1/6th of the distance between the Earth and Moon) where a sub-satellite could exist. If an object lies outside the Moon's Hill sphere, it will orbit Earth instead of the Moon. The only problem is that the sub-satellite cannot stay in orbit around the Moon indefinitely because of tides. ** Despite this being the second Star Trek reference in this blog I need to say that I'm really not that big a Star Trek fan, although I do deeply, deeply respect it. Earth has a “second moon,” the asteroid 3753 Cruithne that I’m too lazy and tired to explain. As much fun as it is to be reminded of how mind-boggling the universe is it can also leave you feeling cold, alone, and insignificant. On the other hand, most of space is empty and what little remains is cold, boring rock and dust. It's important to remember how fascinating it is to be human, especially a human in 2007 with a high-speed internet connection so you can watch scenes from the fantastic 1974 film adaptation of The Little Prince co-starring Gene Wilder and Bob Fosse! If my kids don't sound exactly like the Little Prince I'm disowning them. As far as I'm concerned all children should speak with British accents, have perfectly messy hair and smell of peanut butter. Oh, and while we're at it, check out how much Michael Jackson completely ripped-off Bob Fosse in this clip!